Not much birding to report on during the past 10 days, apart from a brief visit to Oare Marshes last Tuesday on the way back from taking my mum to see my dad in the home in Margate he is currently staying in. I needed a distraction away from the plight of my old dad, who is still battling with delirium. He has a long struggle ahead and there's no guarantee he will come out the other side. The analogy I have come up with is one where he is constantly trying to climb up a sand dune. The sand is him getting older and his climb is the battle to find a route to clarity in his mind. But the longer it takes the harder it will become. At this stage we can't know what the long-term prognosis is, but for his sake I hope along the way he finds piece of mind, something he doesn't have at the moment. So a quick visit then to Oare. 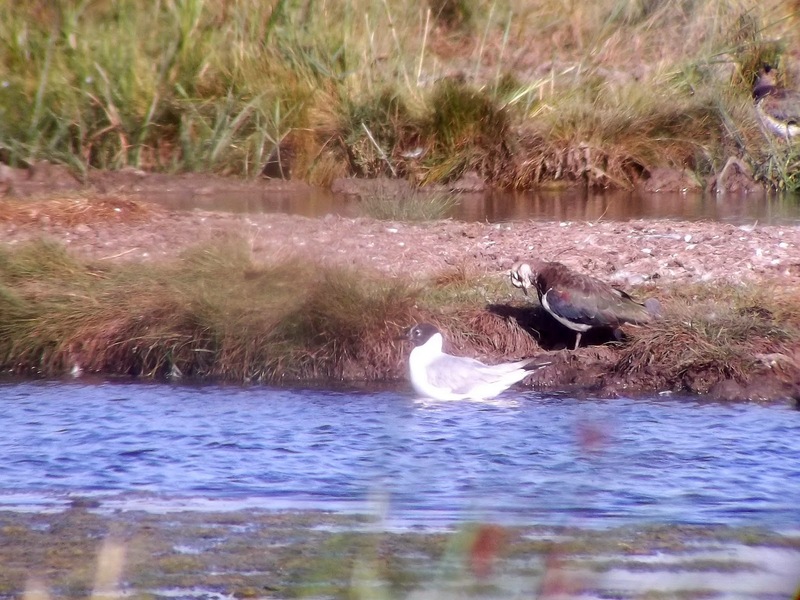 The target was the Bonaparte's Gull, probably the same long-staying bird seen there the year before. A sighting would marginally make up for missing the one at Staines reservoir at the beginning of June. Oare Marshes is great value because, apart from producing good birds, it is an easy reserve to get round. You can scan the East Flood from your car if so inclined. As it was, I locked on to the Bonaparte's Gull pretty much straight away. It was asleep for much of the time on a small mound before it took a swim around the area. After that it flew over to the mudflats of the Swale estuary to feed. So that was that. Since then I've trundled around the local patch with just one Common Sandpiper the bird of note, and then this evening took a visit to Staines reservoir for the first time since dipping the Bonaparte's Gull there. I could have gone to Beddington to try for the Glossy Ibis, but having seen the one near Frensham earlier in the year, Staines was a more relaxed option. And I discovered later that the Ibis hadn't been seen since lunchtime anyway, so I made the right choice. As soon as I arrived I immediately spotted a Black-tailed Godwit on the west bank of the north basin, along with another Common Sandpiper. It was nice to meet up with Dominic Pia, who I hadn't seen for some time, and he pointed out a Sanderling on the west bank near to the Godwit, and during the next hour at least eight more Common Sandpiper were seen, as well as at least seven Dunlin. Along with the usual banter it was an enjoyable evening. What next? Not sure really. This weekend, the weather looks dodgy on Saturday, which may coax a few waders to land nearby, so local birding is the most likely outcome. A week on Thursday I've the whole day off and also the following Sunday I'm off to Skegness (yes, I pick out all of Britain's most glamorous towns in my spare time) for another stock car meeting. On the way I plan to visit some of the Lincolnshire birding hotspots, such as Gibraltar Point and Frampton Marsh, which is developing into an excellent reserve.